Stop carrying those heavy buckets. Automate It!! The Auto Water Change System by Ultralife has made changing the water a breeze! Changing the tank water frequently is imperative for a healthy and stable reef tank. But as fundamental, as it is, changing water is such a chore that you just want to skip it. Not anymore! No more having to dread changing your tank’s water. The Tank Boss WCS is an Exciting NEW Automatic Water Change System (WCS) with a number of great features built in. The Tank Boss WCS is truly a Highly Advanced Automatic Aquarium Water Change System. Integrated with a digital timer, safeties and an audible alarm it is the Ultimate Automatic Water Change System. With 5 reed float switches, you are able to keep track of all your levels and even alarms you when needed. 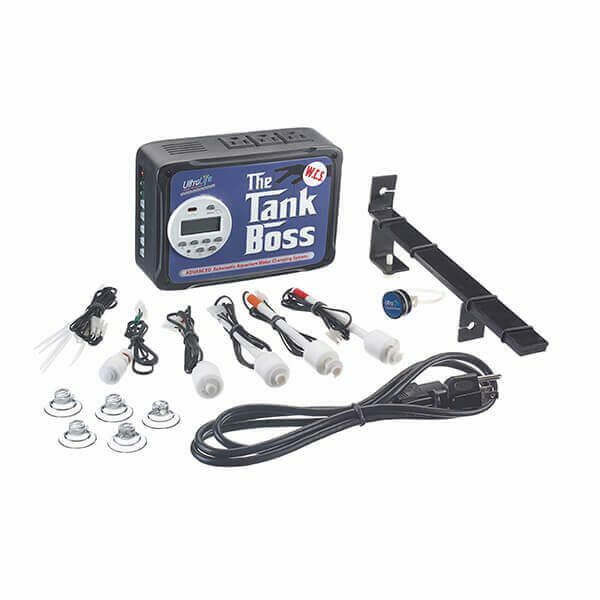 The Tank Boss runs on safe low voltage 12VDC fused protected circuitry and comes with a 5 ft. power cord and cabling, but there are 6 ft. extensions available in case you need extra length to route your sensor or float switches.